Junior Training Camp at Ferrari World, Abu Dhabi, U.A.E. Indoor amusement parks are great for family fun no matter the weather, but a large part of their appeal is the thrill of enjoying outside fun inside. In the dead of Northern winters, or in the soaring summer temperatures of the Southwest, families can enjoy the roller coasters, log flumes and much more indoors, in comfortable 70°F/21°C temperatures. Indoor amusement parks are located in various geographic regions throughout North America – many of them shopping malls – including Minnesota, Las Vegas, and Edmonton. Expect to pay about $30-$40/day per adult; some offer a children’s discount. The age and height restrictions common in outdoor amusement parks apply here as well. Decorated with a Grand Canyon motif, the Adventuredome located at Circus Circus Hotel in Las Vegas, Nevada allows visitors to escape the extreme summer temperatures and enjoy the typically outdoor pleasures of a theme park. Circus Circus’ elevated, indoor, five-acre park features the world’s only indoor double-loop, double-corkscrew roller coaster, the Canyon Blaster, and El Loco, where riders are turned and twisted and then dropped a 1.5 vertical G. New attractions include two Batman-themed laser challenges. While the park has a number of attractions suitable for older children, it also has many activities geared towards younger children such as a carousel, ferris wheel and clown shows. On a much smaller scale but with an impressive 115,000-square-foot facility in southern New Jersey, this is one of those indoor play areas that has grown out of its arcade roots. With a big arcade (of course), I Play America also has a 4-D theater, go karts, laser tag, bumper cars, a swing that propels riders 15 feet in the air, a skyscraper ride and mini-bowling. 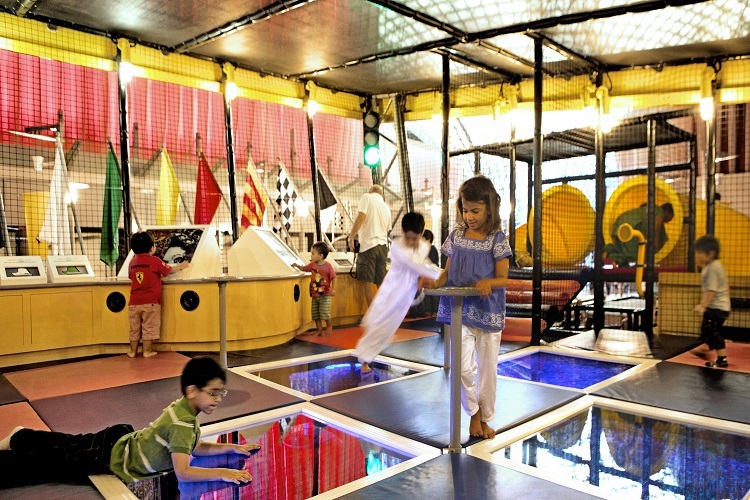 Just iKidz soft play area offers web bridges, cargo slants crawls, and pad hops for kids 3-9. There is a variety of old-school boardwalk games and a classic carousel, as well as a fun freefall simulator for older kids. Part of the Mount Olympus Water and Theme Park Resort with wet and dry fun both indoors and outdoors, the Parthenon offers mostly gentle, old-fashioned fun for families. Catering more to the younger set with a mini coaster, go karts and bumper cars, Parthenon also offers a rock climging wall, lazer tag and an arcade. More than a gimmick but not exactly a trend, indoor play spaces in various shapes and sizes dot the landscapes of several other countries. Here are some unusual ones. Once again, Alberta, Canada’s West Edmonton Mall claims a number of “world’s largest” titles at Galaxyland. At 400,000 square feet, it is the world’s largest indoor amusement park with over 24 rides and attractions. The theme park features Mindbender, the world’s largest indoor triple loop roller coaster, and Galaxy, four stories of space-themed area for younger children. Additionally, the mall features other such family-friendly adventure areas as Marine Life, an interactive underground aquarium, Professor Wem’s Adventure Golf Course, a mirror maze at Crystal Labyrinth and blacklight minigolf at Dragon’s Table. The adjacent World Waterpark offers exciting waterplay and wet fun for the whole family. The West Edmonton Mall also offers Toddler Time for kids age 5 and under (with chaperone). This baby-friendly area is open from 12 to 3pm, Mondays through Thursdays and offers storytelling, face-painting and coloring opportunities for your young artists. What’s indoors, part water park, and very amusing? An indoor snowpark. While Japan’s amazing SkiDome SSAWS in Funabashi was the mother of all indoor faux environments (it closed in 2004), the oil-rich and very hot Emirates of the Middle East have taken up the challenge. In 2006 Dubai’s 12-acre Mall of the Emirates welcomed the world’s third largest indoor ski resort. It comes complete with tow-and chair-lifts, five ski slopes presenting varying degrees of challenge, as well as the world’s largest indoor snow park. Ski Dubai is 25 stories high, and its 22,500 square meters are covered with real snow year round. Non-skiers can soak up the Alpine atmosphere in an array of restaurants overlooking the ski runs or at the classy Kempinski Hotel. The Mall also offers 90 minute sessions of swimming with Bentoo and King Penguins, and Wahoo, the Middle East’s first indoor (70%) and outdoor (30%) waterpark. Magic Planet — a large indoor family entertainment center with rides, simulators and children’s rides — and several other dining options. Opened in 1989, Lotte World is a major entertainment complex with a hotel, movie theaters, performance spaces, an ice-skating rink, shopping malls and even a Korean Folk Museum. The indoor amusement area is an enormous four-story tall space, and is one of the most popular parks in the world. It offers rides ranging from gentle to thrilling and a playground for kids under age eight. 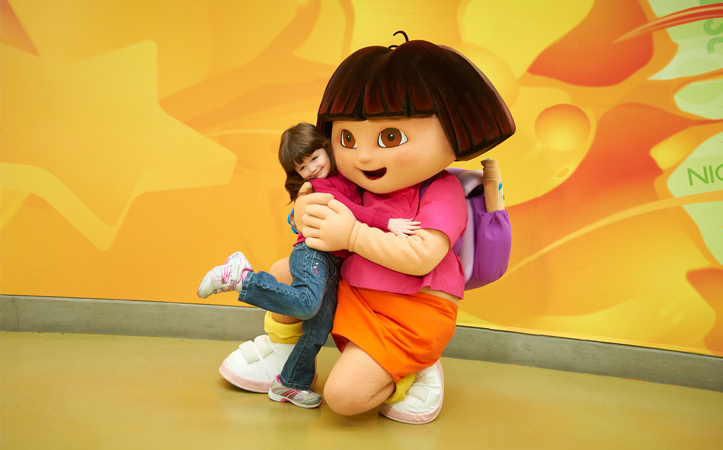 Where is the world’s largest indoor amusement park? At 925,000 square feet (over 20 acres), the title goes to Ferrari World. Covered by a Ferrari-red domed roof, there are a variety of driving/racing themed activities for kids and families from gentle to thrill-seeking rides. Khalil’s Car Wash is for the youngest drivers; Tyre Twist is based on a traditional teacup ride, but in a tire; and the Scuderia Challenge has you “race” a Ferrari with a state-of-the-art racing simulator. Get more ideas for family-friendly Las Vegas attractions.